Jamie says: Last night I had dinner at my Grandma’s house. She cooked up a storm (as usual). She made sausage hoagies with peppers and onions, salad, fennel grapefruit salad, prosciutto fig wraps, vegetable soup, and desserts. She’s 83. I hope when I’m 83 I’ll still be cooking like my Italian Grandmother. Pre-heat a small frying pan on a burner set on medium-high heat. Mix egg, cinnamon, and milk in a bowl. Dip both slices of bread, front and back, in egg mixture. Lightly spray pan with cooking spray. Place slices on frying pan (one at a time or side by side depending on pan size). Cook for about 1 minute or until egg is cooked. Flip and repeat to cook other side. Use a cookie cutter (e.g. star shaped) to cut out the center of the French toast slices. 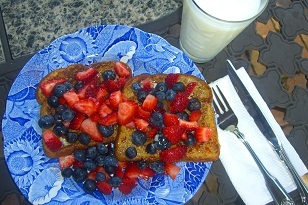 Fill centers with yogurt and place cut-out French toast pieces on the side. Serves: 1. Serving recommendation: Serve with a piece of fruit. Enjoy! The key lime pie yogurt tastes refreshing and its consistency is just like whipped cream/melting ice cream! Nutrition note: Get creative! Use kitchen tools (like cookie cutters) to make healthy foods fun. 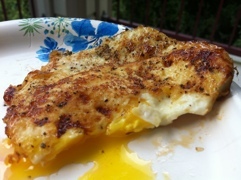 Kathryn says: Sweet and salty tends to be a winning combination, so this morning, I thought why not try it with an egg? A touch of honey brings just the right amount of subtle sweetness to this classic breakfast fare. 1. Lightly grease a frying pan with cooking spray or olive oil. 2. Crack egg and pour into pan on stovetop on medium-high heat. 3. After the egg begins to solidify, drizzle honey on top. Sprinkle salt. 4. Let the egg continue cooking until it looks halfway cooked, and then flip. 5. Add pepper. Cook to desired liking. In a medium pot on high heat, bring 3 cups water to a boil. Add shells and cook for 12 minutes. Drain. Meanwhile, grate cheese; chop tomato and sprinkle with half the salt and pepper (reserving the other half); chop turkey; halve olives. Toast walnuts by placing on a small plate and microwaving for 1 1/2 minutes, rotating, and microwaving an additional 1 minute. Crush walnuts. In the hot pot, mix cooked and drained pasta with cheese, spinach, and extra virgin olive oil until cheese is melted and spinach is wilted. 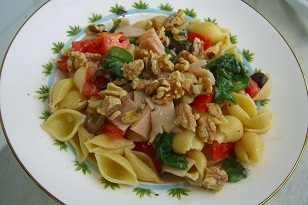 Stir in tomato, turkey, olives, walnuts, and remaining salt and pepper. Flavorful! I like the nutty taste the walnuts add. Nutrition note: Looking to go a little more natural? To start, aim to eat more foods with ingredients you can pronounce and understand. Jamie says: I just got back from my first cruise! Ever been on one? It was a great experience. I mean, how many people can say they took a cruise through Hurricane Irene? The waves were huge, the wind was strong, and the boat was rocking like crazy. But that all went away- eventually. Thank God for my strong stomach. And although we didn’t go to the Bahamas, our trip to Key West was fun. In all honesty, it was an awesome experience, though. I got to reunite with my 5 dorm buddies from freshman year (Simpson Hall). We had lots of fun and made so many memories. I wouldn’t change my trip if I could. Scoop pudding in a small bowl. Top with chocolate chips. Slice bananas. Dip into pudding using a toothpick or spoon. If it has chocolate it’s automatically delicious, right? I liked the extra chocolate surge from the chocolate chips. The bananas were a good vehicle to deliver the chocolate. I’m not addicted… I just love chocolate! 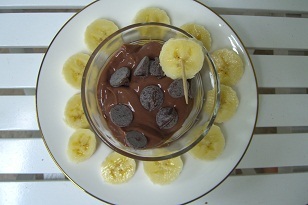 Nutrition note: Using pudding instead of pure chocolate for a fondue base cuts down on the calories and adds some calcium. Preheat oven to 425°F. On a cutting board, cut kernels off of ears of corn. Place corn kernels in a large metal baking dish. Thinly slice bell pepper. Slice onion. Add to corn in baking dish. Add 3 Tbsp olive oil (reserving 1 Tbsp), sea salt, ground pepper, and cumin. Squeeze juice from 1/2 lime on top. Mix well. Drain and rinse black beans. Pour in a small baking dish. Add reserved 1 Tbsp olive oil and paprika. Bake corn mixture and black beans in oven for about 25 minutes. Meanwhile, chop avocado. Add to a medium bowl along with coleslaw, white vinegar, and brown sugar. Toss together. Refrigerate. Heat a large frying pan on the stove top on medium-high heat. Meanwhile, chop a jalapeno. Add olive oil to pan, followed by shrimp, taco seasoning mix, and chopped jalapeno. Squeeze juice from lime on top. Mix well. Reduce heat to medium. Cook for about 5 minutes. Flip shrimp and cook an additional 5 minutes or until pink and thoroughly cooked. Shred cheese using a grater. Drain juice from olives. 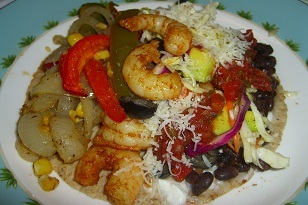 Prepare taco: In each tortilla, scoop roasted corn, onions, and peppers; black beans; shrimp; sour cream; salsa; olives; cheese; and coleslaw. Awesome! So flavorful! Reminded me of my eating adventures at taco trucks at the Mission District in San Francisco, California and at the Seminole Hard Rock in Hollywood, Florida. Nutrition note: Eating vegetables shouldn’t be boring. Spice ’em up and add them to your favorite foods (like tacos). Jamie says: As a South Florida girl, I’m used to hearing about potential hurricanes and tropical storms that threaten the area. But this time, I have a heightened interest. I have my first cruise booked for this weekend with a bunch of friends from my freshman year of college. Hurricane Irene, please go away! In a very small bowl, mix together Smart Balance buttery spread and honey. Refrigerate prepared honey butter. Rinse strawberries and blueberries. Pat dry with a paper towel. Chop strawberries. Set aside. Place French toast on a plate. 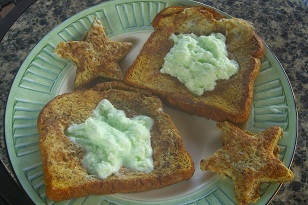 Spread honey butter on French toast. Top with strawberries and blueberries. Serves 1. Serving recommendation: Serve with a glass of fat free milk. Enjoy! Delicious! I love the taste of the honey butter. Nutrition note: To reduce your saturated fat intake, swap out your butter for a healthy margarine, like Smart Balance whipped buttery spread. Make sure it has no trans fats or hydrogenated or partially hydrogenated oils, though. Many margarine products may even be worse for you than butter. For an extra health benefits, look for one with omega-3s. Jamie says: We bought another 6 pack (of canned salmon, that is). 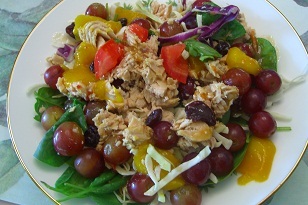 Here’s another delicious salmon salad recipe (in addition to the Salmon Ginger Arugula Salad I made last week). Toss spinach and coleslaw together in bowl. Drain salmon juice. Scoop salmon on top of salad. Chop tomato and place on top of salmon. Chop mango and add to salad along with grapes and dried cherries. Nutrition note: Salmon is an excellent source of vitamin D and omega-3s.